Strong metalized polyester and linear low-density polyethylene with 3/8" seals on three sides work well with heavier products. Does not stretch or tear easily. Barrier material protects food from gas, odor, and moisture. 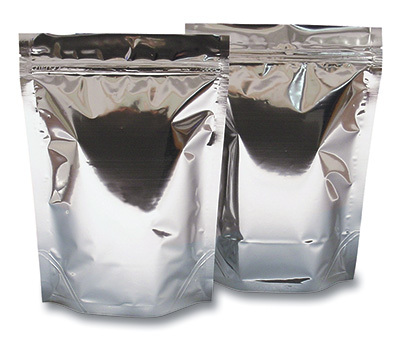 Heat sealing above the zipper and tear notches make the bags both tamper evident and easy to open. Bottom gusset increases volume compared to standard bags and allows bags to be stored upright. Meets FDA and USDA specifications for food contact. Usable dimensions are slightly smaller. Custom printable.